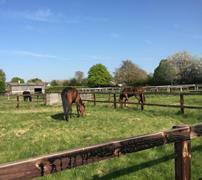 It is lovely to get the horses out in the paddocks for a pick of grass and some sun on their backs. As you can see, everyone's heads are down and making the most of the spring grass. This weather will definitely help bring their summer coats through. It was busy here at Chestnut Tree Stables yesterday for the middle day of the Craven Meeting. 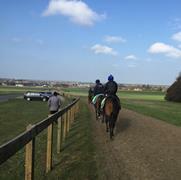 Lots of owners in to see their horses training ahead of racing on a lovely spring day in Newmarket. 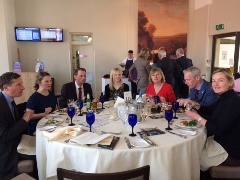 Many thanks go to the Jockey Club Estate and Jockey Club Rooms for giving them a such special day at The Rowley Mile Racecourse. It was very much appreciated and made for some very happy owners. 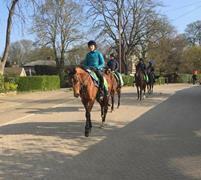 It was a sunny but chilly morning as second lot headed over to Warren Hill today. They all had a good workout before heading back down again and home for breakfast. 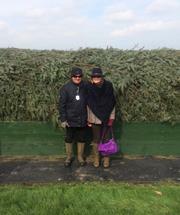 Rae and Rachel were first timers at Aintree yesterday which was surprising considering Rae's brother Richard won it on Red Marauder in 2001. They joined the ROA's Aintree Hospitality day which included a course walk with jockey Danny Cook who also kindly took these photos. Rae and Rachel are standing in front of Becher's Brook together and Rae at the The Chair. 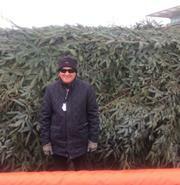 Both fences dwarf them! Danny rides Vintage Clouds in the Grand National tomorrow so we wish him good luck. 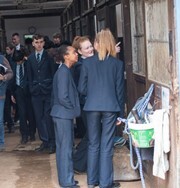 Discover Newmarket Tour we gave the students a taste of what a typical yard tour at Chestnut Tree Stables was all about. We were under a bit of time pressure but we managed to show them lots of interesting elements of a racing yard and introduce them to some of the staff and of course our wonderful horses. They seemed to have a good time! They may even be inspired to look at the racing industry for their future career.